The year of 2012, I had the honor of chasing the CSX Santa Train on the former Clinchfield line. I started off early in the morning at about 5:00. It was a very eventful day of shooting, with clear skies, and a great temperature only added to the experience. This train runs to give food and gifts to parents and children who need it. It is a joined effort with; CSX, The Kingsport Chamber of Commerce, Food City, and more. Departing CSX’s Shelby, Kentucky yard near Pikeville, KY at the early morning hour of 6am on November 17th, 2012, the 70th annual running of the Clinchfield Santa Train began its journey south under the power of SD40-2, No. 8140, F40PH No. 9993, and 10 of CSX’s business passenger cars. Serving as a Clinchfield tradition for seven consecutive decades, the 2012 running of the Santa Train distributed gifts to anxious children at 14 locations along the 110 mile journey from Pikeville to Kingsport, TN on CSX’s Kingsport Subdivision. The event is made possible each year thanks to the countless volunteers of the various sponsoring organizations such as CSX, Food City, Kingsport Chamber of Commerce, and more. Over 15 tons of toys, canned goods, and clothes were donated for distribution to children and residents of the small Appalachian communities of Clincho, Dante, St. Paul, and more. Thompson Square, a popular country duo also assisted Santa in the distributing of gifts, and performed for residents upon the arrival of the Santa Train in downtown Kingsport, Tennessee. Following the unloading of remaining gifts in Kingsport, the equipment deadheaded south, following the route of the former Clinchfield to Spartanburg, SC and eventually back to Jacksonville, FL at the Corporate Headquarters of CSX. 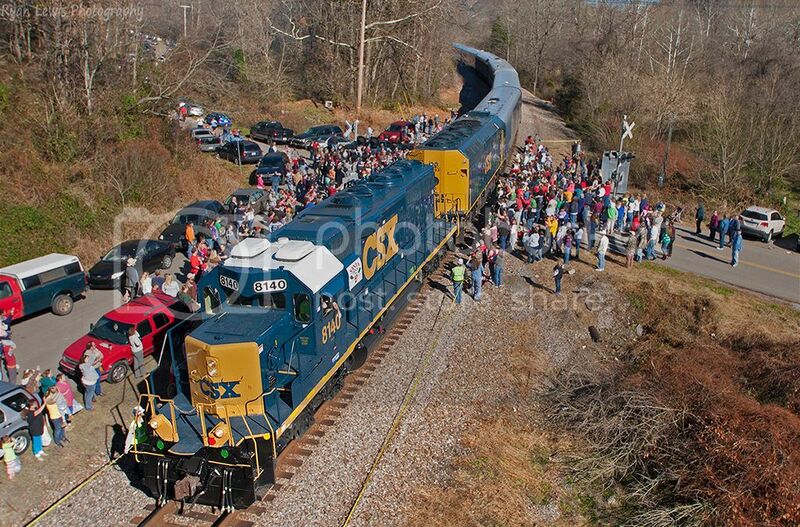 Seen below, The CSX Santa Train making his stop in Ft. Blackmore to throw the presents to the kids there. Last edited by Ryan Lewis; 02-26-2013 at 03:39 AM. Thanks! If you ever get the chance to chase it, you should defiantly do it! It is a lot of fun, and it is pretty easy to chase.